Exosomes are small vesicles that are secreted by various types of cells, known to mediate signal transduction between cells. During recent years, novel carriers for the delivery of targeted drugs, chemotherapy drugs and RNAs are under development, which is believed to be beneficial for patients. Considering issues of drug nano-formulations in bloodstream, such as nano-toxicity and rapid clearance by mononuclear phagocyte system, exosomes derived from either patient’s cells or bodyfluids, seem to be an optimal option. 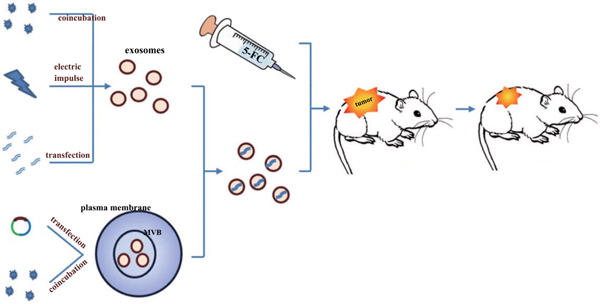 This review presents the current patterns of drug-loaded into exosomes and discusses how exosomes were reconstructed for targeted therapy. Loading either exosomes directly or their donor cells is an alternative, including incubation, electroporation, transfection of exosomes or transfection, incubation, activation of the parent cells. To solve the low efficiency of cargo loading into exosomes, protein loading via optically reversible protein-protein interaction can realize a novel exosomal protein carrier. In addition, targeted therapeutics with exosomes is achieved by three means, via adding targeting peptides into the surface of exosomes, by transferring specific genes within exosomes into tumors to establish a therapeutic target and, lastly, by targeting at exosomes containing tumor associated antigens. Nevertheless, purification and mass production of exosomes need further exploration, as well as more approaches were applied to targeted therapy. Therefore, exosomes could serve as an effective tool for drug delivery and targeted therapy. Exosomes, drug delivery, targeted therapy, cancer, electroporation, Tumor Associated Antigen (TAA).